This type of sweating can be inherited.No underlying internal or external causes are present. There is no need to suffer in silence, as Dr. Irena is here to help with a simple procedure that will leave your body confident and anxiety free. Hyperhidrosis can be inherited, caused by hyperactivity of the sympathetic nerves, drugs, medical conditions, etc. But most commonly it is idiopathic (unknown reason) is estimated that 3% of the population suffers from excessive sweating, But it could be more than this as many people are too embarrassed to discuss this particular problem and are unaware that it is easily treatable with Botulinum, toxin. Botulinum toxin leads to inhibition of the sympathetic cholinergic nerve fibers and reduces or prevents sweat production. By injecting the affected areas with Botulinum toxin, the chemical signals that come from the nerves that control the sweat glands are temporarily blocked. The severe sweating stops as the sweat glands no longer receive the chemical signals they need. What are areas of the body most commonly treated? After ruling out any underlying medical conditions, Dr. Irena will begin treatment for Hyperhidrosis using Botox injections. A numbing cream can be applied to the area 30 minutes before the surgery, although many patients choose an icepack instead of the cream. The procedure itself takes only 20-25 minutes, during which time a fine needle will inject the affected areas with the Botulinum toxin. Dr. Irena recommends that you do not touch or apply anything to the treated area for 4 hours after the procedure and that it is best not to exercise for 24 hours. You will begin to see and feel the effects 1-2 weeks after having the treatment. Results will last 6-12 months and as much as 18 months in some cases. It is recommended that you return every 9-12 months to experience the best possible outcome and to prevent your symptoms from returning. Several preconditions make you an ideal candidate for the Treatment of Hyperhidrosis (Excessive Sweating) using botox. Severe sweating at the foot, palm, and underarm. You need to be well aware of the possible risks of the surgery. The treatment takes 20-30 minutes and can be performed in doctor’s clinic. Follow the doctor’s instruction to get maximum outcomes of the treatment. What is the Cost of the Hyperhidrosis treatment in Dubai? The cost of the treatment is not fixed but you can have an idea about the price in your case by doing some arithmetic. The cost often depends on the expertise of the professional, the location of the clinic, and the nature of the issue. Please do not hesitate to contact us if you want to know the price of the treatment in your case. How does Botox reduce excessive sweating? Botox briefly squares synthetic signs from the nerves that invigorate the sweat organs, along these lines lessening sweating in the infused territory. Botox is by, and significant exceptionally viable – a 90% lessening in perspiration is accomplished by most patients after one treatment. The stench, by and large, enhances as an immediate aftereffect of the lessened sweating. However, this isn’t the case. Is Botox a safe treatment for hyperhidrosis? Reactions are uncommon. Moreover, there is insignificant downtime, and ordinary day by day exercises can be continued the following day. One proper procedure after every 9-10 months are recommended for optimal results. 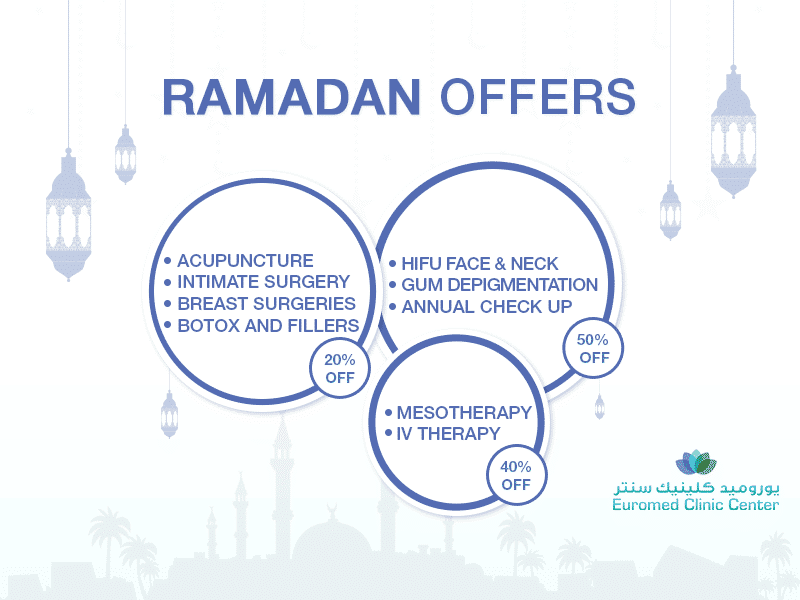 Contact Euromed today, and discover how easy it is to make the positive changes that will greatly improve your day-to-day life.